We hear this from our customers all the time. Crutches hurt. They’re hard to walk in. Navigating stairs is dangerous. Underarms get bruised and rubbed raw. Arms and shoulders fatigue. But most of all, crutches fall short because they don’t allow you to use your hands. iWALKFREE is a hands free crutch substitute. It’s a first of its kind mobility device that frees you from the limitations of conventional crutches. Just as our name implies, iWALKFREE allows you walk with your hands free, allowing you to live a normal and active life that would be impossible with conventional crutches. With iWALK 2.0 as your crutch alternative, you don't have to adjust your lifestyle for weeks or months as your injury heals. Instead, you can simply continue your typical routine. Losing mobility and the ability to function in day to day life can be an unimaginable hardship. Learning to cope with an injury without being able to get through typical daily activities and work can create tremendous mental stress. 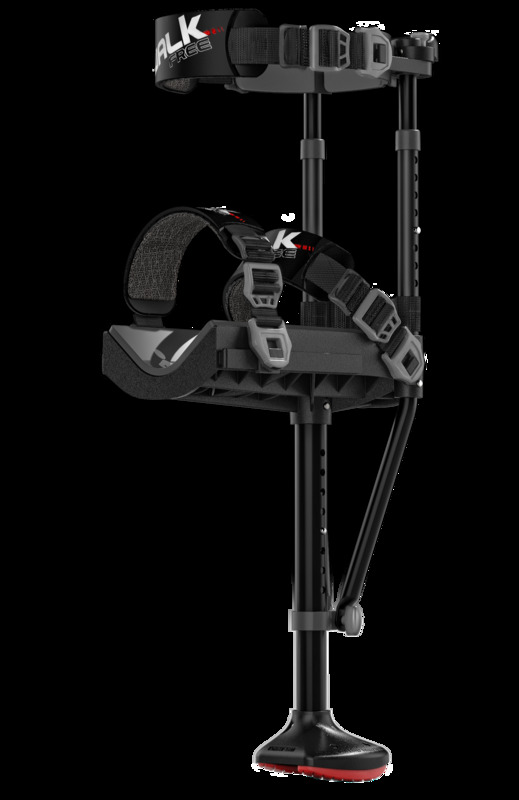 The iWALK 2.0 is the alternative to crutches that can help ease the stress of managing daily activities with an injury. 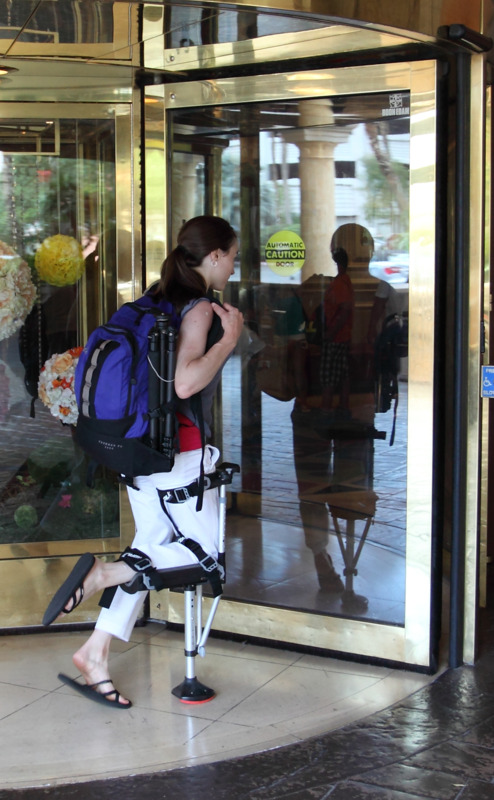 The iWALK 2.0 gives you much more than just the ability to walk. It gives you back your freedom. Use it or lose it. It’s true. Conventional crutches do little to work the muscle of your injured leg. Non-use can lead to muscle atrophy , loss of strength and coordination, decreased flexibility and bone density loss. With iWALK 2.0, all the upper muscles in the leg, hip and buttock are fully engaged in the acts of walking and standing. This protects against the detriments associated with lack of use. Think of all the things you can’t do when using conventional crutches; preparing a meal, walking your dog, carrying a cup of coffee, pushing a shopping cart. Well, you no longer need to have your life interrupted -­‐ the iWALK2.0 sets you free to resume your day to day routine and enjoy pain free, functional mobility. Stop sitting on the sidelines of your own life because a lower leg injury is impeding your mobility. The iWALK2.0 allows you continue your daily routine with little to no interruption, all while safely letting your lower leg injury heal. If you have a lower leg, ankle or foot injury that is required to be non-weight bearing during recovery, then, in most instances, iWALKFREE will work for you. Typical injuries include (but are not limited to) any sprain, strain, fracture, dislocation or surgery to the lower leg, ankle or foot. Common conditions we experience are sprained ankles, fractures of the lower leg, foot or ankle, Achilles tendon injuries and surgeries, foot surgeries such as bunion or foot ulcer correction. iWALKFREE is also useful as a gateway device during prosthetic limb transition periods or as a shower / swim prosthetic for users of permanent prosthetic limbs. 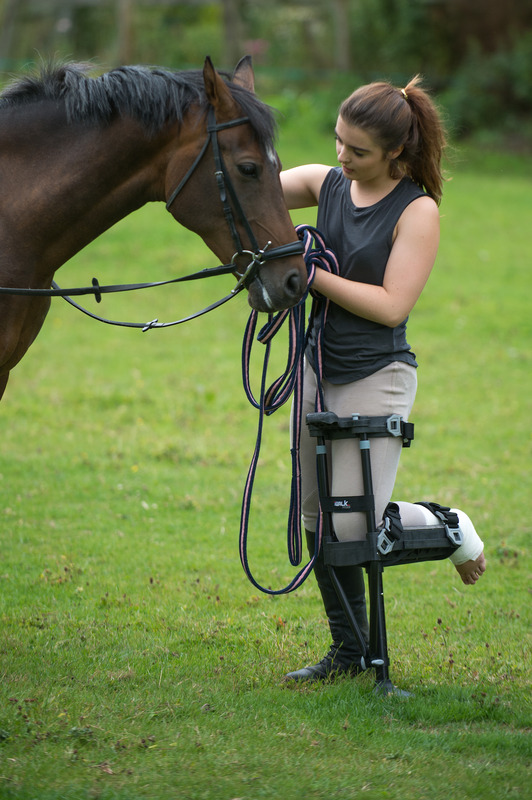 In short, if you’ve sustained an injury to your lower calf, ankle or foot, and you need to be non-weight bearing, then iWALKFREE can be used instead of conventional crutches. The bottom line is that losing the use of a lower leg, foot, or ankle should not also mean losing the use of your hands and arms. The most obvious benefit of the iWalk leg crutch in comparison to conventional crutches, is that it is hands-free. Hands-free means that there is no interruption to your normal day-to-day routine. 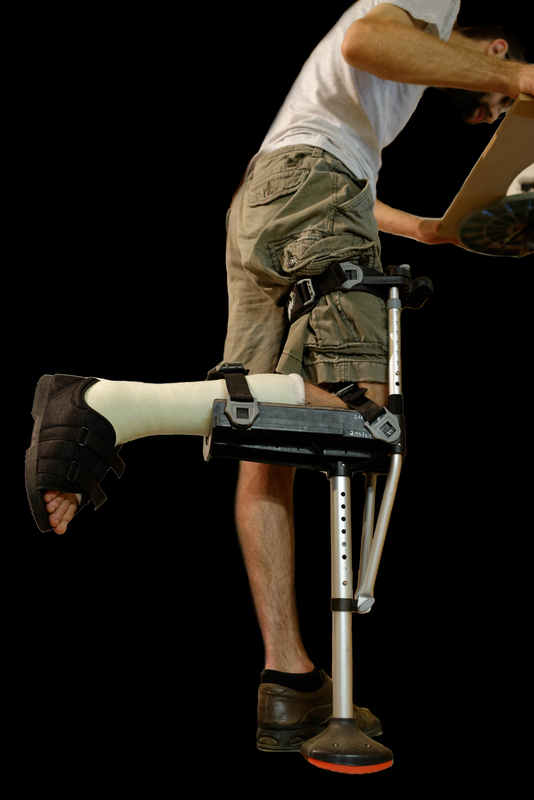 It may sound basic, but it is a freedom that conventional crutches or other crutch alternatives (such as knee scooters) cannot provide. We are the best crutch alternative (no, we aren't just bragging) because the iWALK 2.0 makes it possible to do things like walking the dog, cooking, making copies, opening a door – simple tasks that take on a whole new level of difficulty when you use conventional crutches. With iWALK 2.0 as your crutch alternative, you can live the lifestyle you did before your injury. Numerous patients, medical experts say, referring to various clinical studies, have been given the opportunity to enjoy life once more after years of pain and discomfort after undergoing hip replacement surgeries. However, not just anyone can avail of a hip replacement surgery even if this has been shown to substantially improve the quality of life of a hip recipient. Before this life-changing surgical procedure may be approved by a doctor, certain conditions must first be present. Before this option may be taken, there are numerous factors that must first be considered. The patient’s age, present health conditions, commitment of the patient, and support of the family are just a few examples. The pain and stiffness referred here is the type that cannot be relieved by ordinary medications and other therapies. A patient with this type of constant pain may have a difficult time performing basic daily routines such as walking, eating, sitting, and even changing of clothes. Aside from narcotics, all other forms of applicable remedies have been tried and still no improvement has been noticed. Medications, devices, behavioral changes, injections have been tried by the patient without any effect even after enough time has been allowed for these remedies. Extensive damage to the bones in which failure to address it would only worsen the condition is another instance where hip surgery may be required. This type of damage may be adequately assessed by the doctor with the use modern imaging equipment. Consideration should also be given to the extent of deformity that may have been caused by the chronic hip condition. Indications of this would include the appearance of bowed legs and disfigurement of the overall posture. In any surgical procedures, risks have always been acknowledged by healthcare providers and this extends to hip replacement surgeries. Complications from hip replacement surgeries have traditionally accounted for only five to ten percent. With the introduction of the metal-on-metal hip implants, which became popular with many surgeons, this figure has significantly increased. Patients who have been seriously injured due to the very high failure rates of these metal implants have been compelled to file hip implant lawsuits against manufacturers such as Biomet. Legal experts have observed that litigation of these hip implant lawsuits has been moving quite well, including that of Biomet’s multidistrict litigation (MDL). As part of the litigation process of this MDL, a new set of members have been named to a very vital committee.